It’s more important than ever to befriend your own inner parts, even if you have never been able to do so before. Building ongoing relationships with parts of your psyche is much-needed, and the need is magnified in these times we are living in. What if aligning and befriending YOUR inner parts was a key to world peace? What if world peace starts with inner peace and harmony? Consider if your role — in this process of upleveling our world to live in love, harmony, and interdependence — is to co-create aligned relationships within first, before you “try” to do the outer world things. My teacher, mentor, friend, and founder of The True Purpose Institute (True Purpose Community & Training) is reprising the parts work course, Inner Harmony, starting with this no-cost deep dive into understanding and working with the Inner Critic. For many of us, our inner critic is THE biggest source of internal suffering — sabotaging real satisfaction, success and joy. It often seems like the biggest barrier to fulfilling our purpose by undermining our self-confidence and self-esteem. We may try to silence our inner critic, yet attempting to do so can often backfire. What if, instead, we could transform our inner critic to an ally? 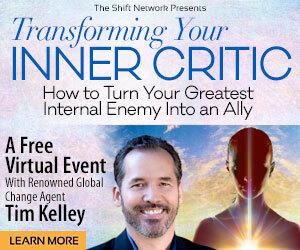 Tim Kelley will offer a strikingly different approach to working with the inner critic in a free virtual event hosted by The Shift Network: Transforming Your Inner Critic: How to Turn Your Greatest Internal Enemy into an Ally. m will be sharing a powerful process based on a kind of inner harmonization of voices. If you don’t know Tim, he’s a globally respected change agent and coach who has taught powerful transformation skills to thousands of people — from billionaires to CEOs to coaches to social change agents.